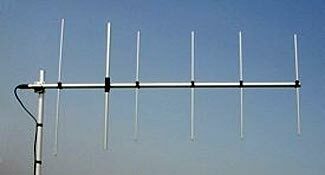 This easily constructed or inexpensive to purchase six element 2m Yagi antenna has excellent directional focus. A directional antenna can give you a massive increase in the strength of signal you transmit, and in your ability to clearly receive weaker further-away signals in return. If you are currently having problems communicating with another person while using omnidirectional antennas, a directional antenna might be an excellent solution. Note that a semi-synonym for a directional antenna is a ‘high gain’ antenna. And also note that in all cases, an antenna is not ‘creating’ extra power. All a directional or high-gain antenna does is focus the power it has in one direction. That makes for a stronger signal in its focused direction, with the trade-off being a weaker signal in other directions. Think of it a bit like a light bulb. If you put a reflector behind the light bulb, and/or a lens in front of it, you can shine a narrow small spot of light a further distance than if the light shines out in all areas equally. This points to one consideration with a directional antenna. If you start using one, you could be shutting yourself off from communications coming from other directions. Might you need to be able to receive unexpected communications from other directions too? If so, you need two receivers or two antennas. Directional antennas aren’t always appropriate. For example, when you are in a mobile communications environment, you want to have an antenna that transmits and receives more or less equally in all directions, because you will be facing in different directions and the path from you to whoever you are communicating with will vary enormously and somewhat unpredictably, as both you and/or possibly the other person moves about. But if you are wanting to communicate from one fixed point to a second fixed point, a directional antenna becomes more relevant, because you know pretty much exactly where you want to focus your radio signals. Do You Need a Directional Antenna? Before we go too far into this article, it is necessary to first examine if you actually need a directional antenna or not. If you have a clear signal already between your fixed location and the person you wish/need to communicate with at their location, there might be no need to add a directional antenna. Of course, if you are struggling to understand each other, then you both should consider adding directional antennas. A single directional antenna added to either radio will help both of you, but if you both add directional antennas, that will provide even better results. There are also two situations when adding a directional antenna might provide a benefit, even though you have good communications with normal antennas. The first is that with a stronger directional signal, maybe you can reduce the transmit power you are using to communicate. In a future situation with grid power down, you’ll all of a sudden find each watt of power is a precious commodity to be very carefully used. If you can reduce your transmit power from 50W to 5W, or from 500W to 50W (in both cases by using a 10dB gain antenna) then that might make a big difference to your total available power and how long it will last. The second situation is that maybe you are in an area with a lot of congestion, and by using directional antennas, you are able to selectively receive signals from one direction and ignore signals from most other directions, making it easier to get the transmissions from the other person and not have them obliterated by other/stronger signals from other locations. If not congestion from other transmissions, you might have interference from some sort of other device that is sending out ‘static’ – assuming it is not in the line you want to communicate with your partner on, a directional antenna will help you avoid the interference. There’s a weak third consideration as well. By narrowly focusing the beam of the radio signals you are transmitting, and by reducing their power to the minimum needed, you are reducing the number of other people who will also be picking up your signal. You won’t have become invisible and undetectable, of course, but you’ll have lowered your visibility somewhat, and that’s got to be a good thing. In theory, directional antennas can work equally well at any frequency you wish. But the theory needs to be tempered with some practical considerations, the most important of which is that a directional antenna takes up more space than a regular antenna. That’s an unavoidable downside, and is usually addressed by choosing only higher frequencies for directional antennas, because, as you almost surely already know, the size of any antenna is proportional to the wavelength (and inversely proportional to the frequency) it is designed to transmit/receive on. In other words, the higher the frequency, the smaller the antenna. Remember that when we are talking about, eg, the 2 meter band, that is the length of its radio wave, and so a common simple half-wave dipole antenna will be half that length. If you have a large open lot, and a reasonable amount of money to spend, you can consider directional antennas at lower frequencies, but for most of us (especially those who are limited to using higher frequencies with their Technician level ham license anyway) we will choose to concentrate on VHF and UHF frequencies. The smaller the antenna, the lighter it will be, and the lighter it is, the less substantial the support materials and elements need to be, allowing it to become even lighter still, and/or more physically robust. These are all very good attributes to seek out – light weight, small size, and strong. Clearly, the 70 cm band uses antennas that are only about one-third the size of the 2 meter band. While 2 meter antennas need not be huge (about 40″ long for a half-wave dipole) something that measures in multiples of 14″ rather than 40″ will clearly be vastly preferable in most respects. On the other hand, in a rural environment, longer wave lengths can travel more successfully through forests. In an urban environment, shorter wave lengths will be reflected by buildings and travel more readily than longer wave lengths. So you might need to adjust your frequency choice depending on what is between you and the person you’re communicating with, even if it ends up requiring a larger antenna array. We started off this article by suggesting that directional antennas are not suitable for mobile communications. That is essentially correct, but there is one special exception to that. If you stop moving, and if the person you are communicating with is also not moving, and if you know the bearing from you to the other person, then during your transmission you could sensibly use a directional antenna to boost the quality of your transmitted and received signal. In such a case, you’d want as small/portable/lightweight an antenna as possible, which means possibly sacrificing some elements of directionality and signal boost in favor of convenience, but even a 3dB boost in signal is the same as doubling both the transmission power and receiving ability of your radio. If this is to work, you need to be able to know, reasonably accurately, where to point your antenna. There are two ways to do this – an easy way and a hard way. The easy way is to do so by trial and error. You could transmit test signals saying things like ‘I am now pointing the antenna north, now northeast, now east, now southeast’ and so on, and each time you and the other person could decide how strong the signal is. Once you’ve found sweet spots, then try smaller degree changes, and eventually you’ll come up with an antenna direction that seems to work better than other directions. Assuming a not extremely directional antenna, as long as you’re within maybe 30° of where you should be pointing, you’ll be getting helpful improvements in signal strength. The hard way is not necessarily much harder. If you know where the other person is, and if you know where you are, and if you know where north is, you can simply compute what direction to point the antenna at to be pointing directly to the other person. Some GPS units will even do this automatically for you, but of course, in an uncertain future, you don’t want to be relying on the continued availability of GPS service. A compass and map however is wonderfully low tech and likely to survive just about any future catastrophe. If you’re in a marginal communication area, being able to use a directional antenna while mobile might make a big difference. How ‘Directional’ is a Directional Antenna? Directional antennas send the strongest signal in a particular direction, but their beam is still fairly broad (much more so than a flashlight). Generally it is common to be able to be within 15° to the left or right of the antenna’s primary direction and still get almost the same strength of signal. You could be 30° to maybe even 45° either side of the antenna and still get an appreciably stronger signal than would be the case with omni-directional antennas. So it is helpful to have the antenna pointed in more or less the right direction, but it doesn’t need to be laser-straight on target. A few degrees either side is perfectly acceptable. This has a related point, too. If you want to communicate with two or three different locations, then if there is no more than perhaps 90° of angle from the one most to your left and the one most to your right, they can all be well serviced by a directional antenna pointed towards the middle of the group. Which brings up a related concept. Maybe you are setting up a communication system at your retreat, and you know from your property layout and other issues that everyone will always be ‘in front’ of a certain line, but they’ll be all around the place while staying in front of that line. In such a case, you don’t want a narrow beamed directional antenna. You want one that fairly broadly radiates out in front and to the sides, but which has as little ‘wasted’ signal and sensitivity behind it. There are very many different types of directional antennas to consider. You need to consider issues such as potential frequencies you might wish to use, and limits on the size and shape of the antenna you could install, plus also whether you will only need a very narrow band of radio energy focused in a single area or a broader beam to cover a wider area. At that point, you can start to choose from various different antenna types. The simplest is a two piece antenna with a driven element and a single parasitic reflector behind it. Depending on the spacing between the two elements, you can get either a tight or broad focus of radio beam. If you want a more directional (tighter focus) then a three element Yagi is a great starting point, and if you want to go ‘wild and crazy’, you can add more and more and more elements to the Yagi configuration, making it progressively more and more focused and directional. A ten element Yagi can give you up to 13.5 dbi of gain – more than ten times the power of a dipole in its main focused direction, and with about a 3db drop in signal strength at about 20° either side of straight ahead. The Yagi type antennas are excellent devices and easier to construct than it might first appear. But they have very narrow frequency bands. If you wanted a broad-band antenna that could work better than an omni-directional dipole, and which would be suitable for both the 2m and 70cm bands, you could consider a Log Periodic Dipole Array (or LPDA for short). These have moderate directionality and moderate gain compared to a dipole. It is also possible to have multi-band Yagis, or stacked Yagis, one for 2m and the other for 70cm. Please refer to the reference selection below for sources of information on these types of antennas. There are other choices, too, of course, but the Yagi will be your best bet, most of the time. As a piece of trivia, we have been talking about antennas with up to about a 15 dBi gain – about the same as increasing power 20 fold. However, there are some huge antennas, used in the space program, with gains of up to 100,000,000 fold – 80 dB!!! When used with VHF/UHF transmissions, a directional antenna is not going to be able to increase your range beyond the line of sight limit that affects all transmissions at those frequencies. The radio waves slightly bend towards the earth as they travel in an otherwise straight line (which gives you a theoretical range about 15% greater than strict line of sight), but once they’ve passed that point and the earth’s curvature drops away, the radio waves shoot off into space, never to be seen again (unless they bounce off the moon or a satellite and come back again that way, which can happen, but which isn’t relevant for our purposes). So a directional antenna can help you get closer to the theoretical maximum range of the transmission, but it won’t allow you to beat that limitation and go any further. And it won’t penetrate every area where signals don’t currently reach. It might improve reception when foliage is attenuating a signal rather than a structure outright blocking it, and it might also improve reception by sending a sufficiently strong signal to bounce off something else and make it to the receiver via a not quite so direct path, but it can’t do the impossible. Sometimes one type of polarization is better than the other, and there are complex factors associated with that. If you have the ability to experiment with both horizontal and vertical polarization, so much the better. You might notice an appreciable difference one way compared to the other. But the main reason for mentioning this issue is that for best results, both antennas should share the same polarization. Make sure that the people you need to communicate have the same polarization with their antennas that you have with yours. The best introduction to antenna theory, design and building, that we’ve come across is the ARRL Basic Antenna book by Joel Hallas. This is very clearly written and doesn’t overload you with complexity or terribly long equations. It is a great first step to take into understanding more about antennas, and is reasonably priced at only about $24. At this point, if you want to know more, you have some free choices and also another excellent book to consider buying. Here is a pdf from the National Bureau of Standards about Yagi antenna design. It was published in 1976 but is as relevant and applicable today as it was almost 40 years ago when first issued. But it is also complex and obtuse and hard to follow. If you first downloaded that before buying the ARRL Basic Antenna book, don’t let it put you off. The Basic Antenna book is truly basic and easy to follow. If you’d like a broader book that is both easier to read and has a much wider coverage of all antenna related things, you can get a free download of the 1974 ARRL Antenna handbook. This is a massive 338 page book that covers just about all there is/was to know about antennas back then. You should probably get the download, but you would find the current edition very much easier to read and with more focus on VHF/UHF than was the case back then. The current 22nd edition was published in 2013 and is available on Amazon for $38 or thereabouts (the book lists for $50). Your antenna is one of the most important parts of your radio setup. Money spent on a good antenna is almost always a better investment than money spent on more expensive radio transmitters and receivers. There are several reasons why a directional antenna might be of use to you, and there are several styles of antenna that might give you the functionality you need. After discussing the considerations, implications, and choices of directional antennas, we then provide links to further detailed free information and two excellent reference works as well. A question, if I have two antennas (an omni-directional VHF & a directional VHF sited in the direction I frequently need to talk) is there a way I can set them both up to connect to the same radio without the use of a switch so I don’t have to constantly switch back and forth between antennas? A 2nd scenario. If I want to hook up both a scanner and a 2 meter/70cm radio to a discone antenna (like The Diamond D-130J or The Comet DS150S), again how do I do so without constantly having to flip a switch to go from radio to radio depending on which one I’m using so that I can both monitor and transmit simultaneously or is that even possible? If possible, do you have a different antenna to recommend for that than the two I just listed? 1. Two antennas, one radio : This is possible, but not necessarily desirable, and an antenna switch close to your base station is a simple device to install and use. If you do have two antennas, you’d need to match their impedance and phase so they don’t cause problems, and you’d also have to consider their siting very carefully. You might have some interesting results in receiving, and you’d surely have some interesting results when transmitting, because the signals from the two antennas would interact with each other in who knows what manner, creating a very strange net directional pattern. 2. Two radios, one antenna : This is difficult to manage, due to the problem when your transmitter is sending out a signal. You must be able to ensure the receiver is disconnected from the antenna while the transmitter is sending on it, otherwise you’ll literally burn out the receiver. Both receiving isn’t quite such a problem, although not fully optimal. There are some relays out there, either manual ones you’d wire up yourself, or automatic ones, that would probably solve the problem, but the leaked radiation from the transmitter and whatever receiving, without an antenna, on the receiver, could still be a problem if the receiver was tuned to exactly the same frequency the transmitter was working on. When you disconnect the receiver from the antenna, you’d want to short it to ground to try and eliminate any remnant reception. Here’s an interesting product – I can’t vouch for its efficacy – and note that it simply auto switches an antenna between two transceivers, rather than allowing both to receive simultaneously. If you are going to keep the scanner in one band and your transmitter in another band, you could consider a duplexer as a good solution. Comet make a wide range of duplexers that are highly regarded. I hope this helps. Being as how you’ve now bought a couple of antennas from Ed Fong, you should ask him for advice too – he is the true expert, I’m nothing compared to him.